As an entrepreneur, travelling is a necessary part of work. So, proper planning is needed to reduce unwanted costs while travelling. This might take weeks and weeks of planning and research just to get the right deals and discounts. Most often, travelling can be costly if prepared under a short notice. To prevent this always consider a go to place where you could easily negotiate with the price instead of paying the whole amount. Even though, we cannot completely cut the costs, there are several effective ways that we can control the expenditure up to an extent. How to Reduce Travel Costs in a Business? When you travel around, try to ask for corporate discounts and services. The best method to know about different offers and prices, is by calling the agency directly and letting them know about your travel plan. Usually employees at the airlines would suggest a plan that is tailored to meet your travel needs. Also, try to keep in touch with large travel agencies and car rental services, since they give at least 25% discount from the total price. Travel agencies are also a great help in controlling your travel budget. Moreover, most travel agencies add extra benefits to their customers as a token of gratitude. Travel agencies helps in tailoring and controlling the overall budget of the trip and they do all the hard work for travelling. Their services are not only limited to just booking air tickets, but they also include services like booking hotels, renting cars to drop to our destination from the airport and also providing with quality tour packages so that you can have a chance to recreate and have time to have fun and relax. As a frequent traveller, it is wise to collect your frequent flyer points and then use them when booking for expensive flights. Also, you could use offers provided by the credit card company and also certain travel agencies. Collecting points and getting rewards are an added bonus to the whole journey and makes the journey more fun and interesting. Collecting frequent flyer miles is beneficial, since you can cut off a large chunk of tax for the airplane ticket. Having a person to book your flight is always an advantage especially if you are a person on the go. Try to let your travel agency know about your trips beforehand, this is necessary for them to book flights that have the best deals and affordable prices. Moreover, they will suggest you various booking options that you feel is more affordable and comfortable at using in. Consulting a travel agent saves the headache of last minute planning. Also, by using a corporate travel agent, the customer is more focused in making money and less on travel planning. If you are a person who usually relies on third party search engines such as Expedia or Priceline to compare flights, then try expanding your area of search. This is necessary as it gives you a lot of options that you could compare too. Plus, as the option increases, you get a variety of choices to choose from. Also, you might be able to get to know about various destinations and to find regional airports that you didn’t previously known off. This is necessary to find budget airlines. Try using sites such as Which Budget and Attitude Travel. The use of regional airports are very much underrated especially for people who fly a lot. This is because, since regional airports are as not as crowded as the international airports, this means less time is spent at lines and usually they have benefits for travelling like less baggage tax and less ticket price. This is a good hack, if you are an avid traveller and you usually book last minute flights. Moreover, they have less transportation costs and provide less taxes at security checkpoints and gives an overall a better and smooth travelling experience. Also, try to learn from others about regional airports. Most of them usually give a nice opinion about regional airports and say that they make travelling much easier. Also, it enables entrepreneurs more to focus on their work and rather than the travel. The less stress at regional airport saves more time and money. If you are bound for an inland business meeting, that is you are travelling within the state and you do not have time to search for any flight schedules, ask your travel operator to book a train ticket. Trains can become handy when it is high time or the flow of people is too much that there are no reserving plane tickets. The only disadvantage of trains are that they are more crowded and congested and it takes a much longer time when compared to airplanes. But the main advantage of booking train tickets is the price point. You could easily get a spacious super class ticket with the price of a simple first class ticket. Try booking train tickets a bit earlier than usual, since they are very popular among people of all ages and is the easiest go to form of travel. Another factor is that airlines do not necessary travel all seasons, especially during snow and heavy rains, but trains do. This can be an added advantage if you want to reach a place unexpectedly and the weather is not allowing you to fly. How to Save Money on Business Travel? Try to sign up for a frequent rental programs present in various airports and try taking advantage of free rental services and free incentives and rental discounts. Instead of hiring very famous rental services such as Hertz, Alamo and such big companies, try using smaller rental service which operates a bit away from the airport. They comparatively provide lesser rates and have a much better service for frequent flyers. Stay away from extra services like filling up gas and also other unnecessary services such as flyer insurance and so on. These are just methods to get money from busy entrepreneurs. Also, try to understand the various restrictions that the car rental services has especially in the gas and the mileage restrictions. Check the fine print of the document before you pay the full price. Food can be an issue if you are a frequent flyer. Hotel food need not be tasty all the time, as it depends on the hotel and how well it treats the customers. Moreover, some hotels use their brand privilege and even charge a lot for the smallest portion of food just to exercise their brand power. These are all unnecessary costs and prices. If you are really good at cooking, then try going to the nearby convenience store and try to collect some food. This can prove to be the biggest budget saver when you are in a hurry or are in need. Try to book rooms that have an attached kitchenette. This can help you to cut food expenses. You could just go to the local grocery and try to make a meal for the fraction of the cost. Take advantage of the free breakfast that you get at hotels. They are usually continental and can have a wide variety depending on your taste and choices. Try not to use the hotel’s room services, so as to prevent heavy prices on food and beverages. Usually hotels charge a lot just on their room service and they charge a lot of price, especially on beverages such as water and drinks, both alcoholic and non-alcoholic. This reduces the budget on food up to a great extent. Try to bring your own food and snacks so as to remove your hunger. Try not to spend too much on snacks and beverages as they can sometimes be heavy on your health when you are travelling long distances. When booking for airline tickets, try booking in a month advance, so as to reduce the rates. Since airline tickets depends on the season or the flow of customers, it is a wise decision to book them a moth prior before your journey. Also, try to book flights in the middle of the week that is between Tuesday and Thursday. This reduces the traffic at the airport and you do not have to wait for long lines at the security checkpoints. As mentioned earlier, try to look for the best airline ticket offers and travel plans on sites like Expedia and Airbnb. Through these sites different hotel rates and travel products can be chosen from a large number of sources. Choose the offer that you wish to have and such sites will redirect you to another site, stating where to buy the ticket. If you are an individual carrying a lot of luggage and stuff with you. Make sure to learn about the travel fees that they impose on their customers. This is necessary as the rates of luggage are different for different airports and are different depending on the season that the customer is flying. That is, if the customer is flying during a holiday, then the luggage fee will be a bit more than the normal rate. If possible try to avoid checking luggage. If you are driving to the airport, then try to park your car in a long term, offsite parking so as to prevent outrageous and out of range parking expense when you come back from work. Try not to park in crowded areas as this can cause damage to your car unintentionally from other drivers and the rates are usually higher in crowded areas than places a bit far from the airport. If you are a business owner or an entrepreneur, try not to ask your employees to book a flight for you. This is because your employees might not know about the various travel prices and the ticket ranges. Try asking a travel operator for this purpose, they will book an efficient airplane ticket and also will suggest you further services in which you save your money and try to control your expenditure within the budget. They are more aware of the ways that you could save money than your employees. A travel policy is a set of guidelines that the employer expects the employee to fulfil before they leave for an international assignment. It is a set of guidelines stating what to do and what not to do. This is necessary for first time flyers, as it can help you to cut costs efficiently. Make sure to follow what is possible and what isn’t as stated by the company. Establishing a discipline while spending money is an effective way to cut costs. Try to set up a minimum and maximum limit for food items and also in buying things like souvenirs, car expenses and hotel food. Creating such a limit is necessary so as to prevent any mindless wastage of money. This should be clearly listed in your travel policy and should be stated in the travel report. Instead of using your personal credit card, try to use the corporate credit card as a source of income for travelling. This way you can be able to track the expenditure and spending of money. For an added advantage, find a card that provides you with frequent flyer miles, rewards and other incentives. This makes travelling more easy. 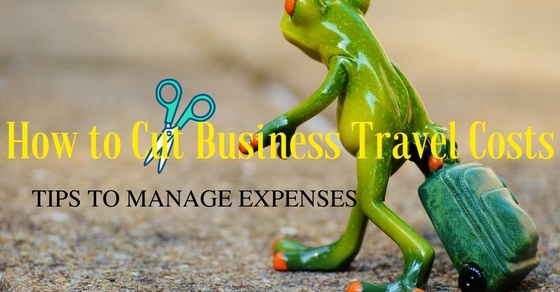 These methods can be used to cut travel expenses when the economic times are tough.